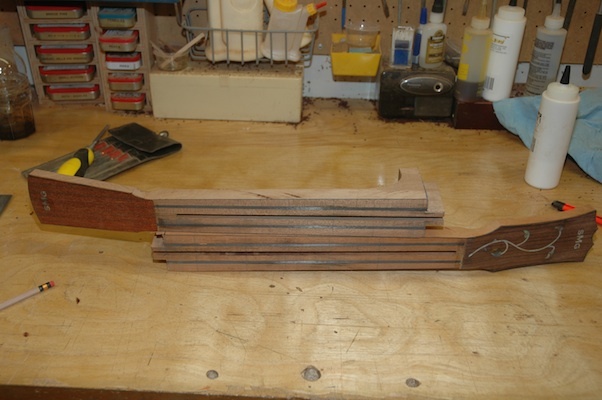 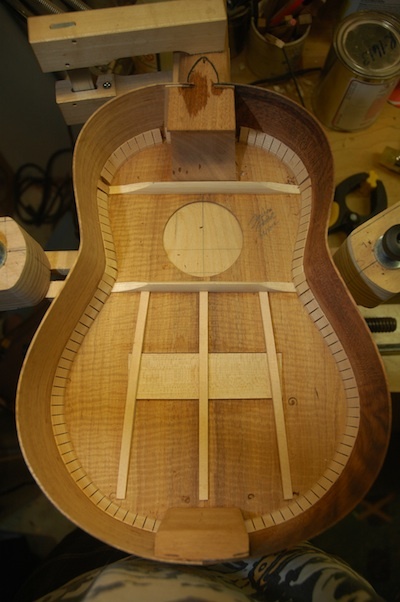 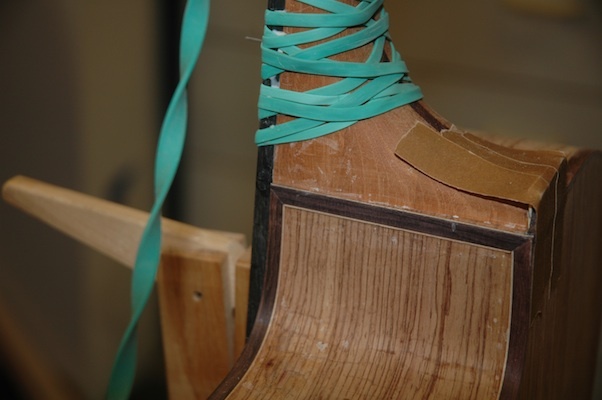 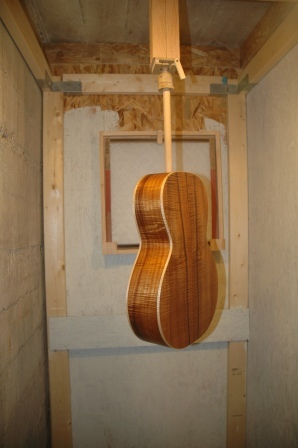 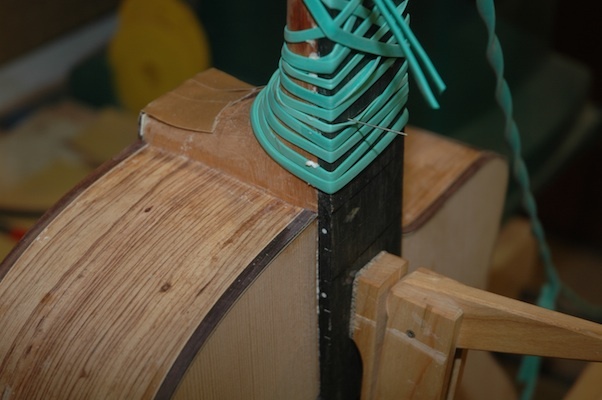 Uke 1201: Frets were radiussed then cut to length and placed in a holder. 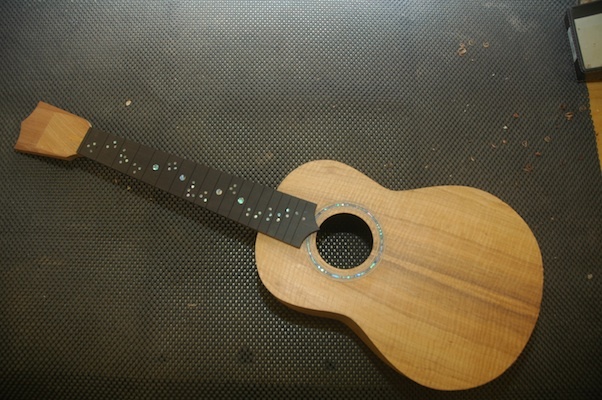 Except for fret 2 and 11, the frets were hammered into place. 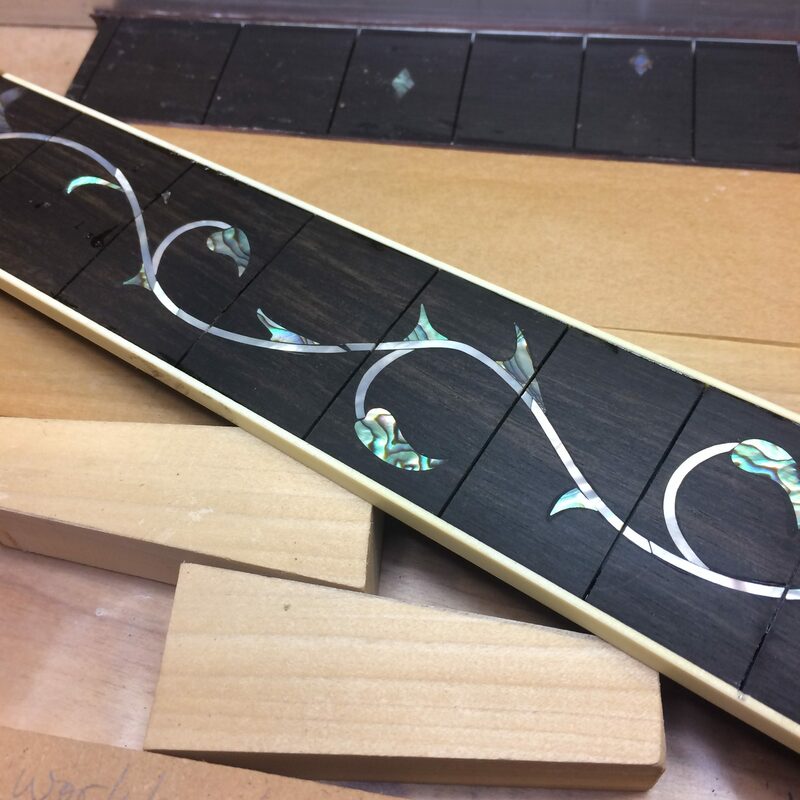 The fretboard was dry fit to the neck, and index holes drilled into the 2nd and 11th fret slots to hold the board in place for gluing. 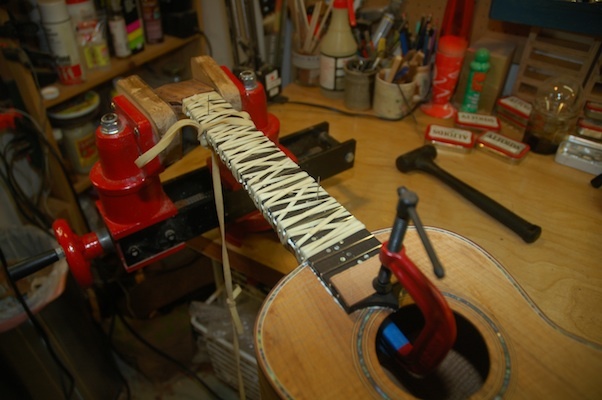 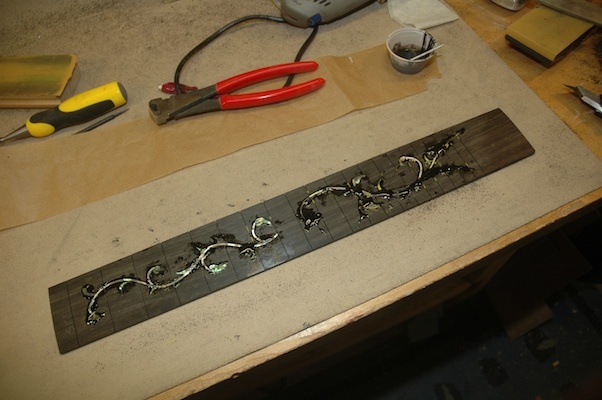 Glue was applied to both the fretboard back and neck, then pressed into place using index pins. 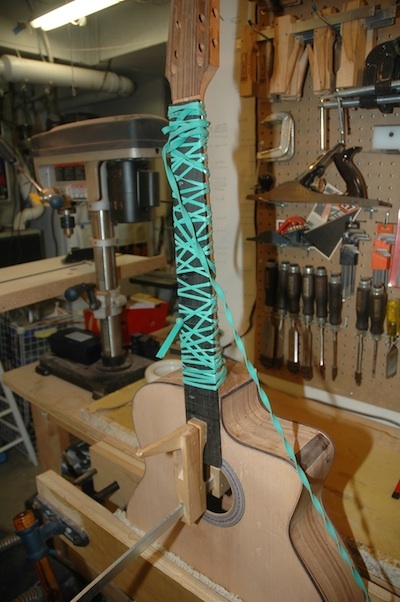 The clamping is a big old rubber band wrapped around the neck several times. 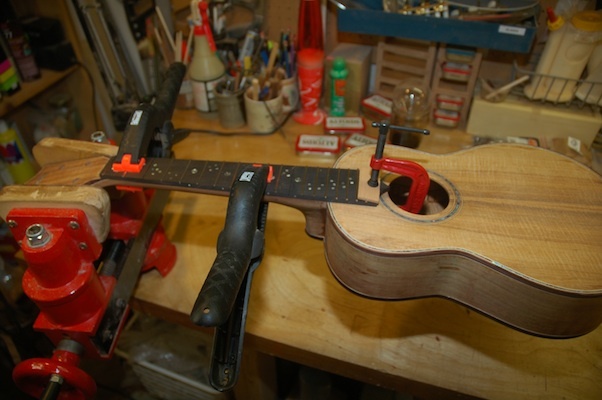 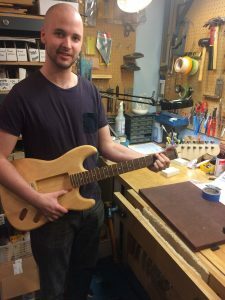 The fretboard extention over the body is clamped down with a simple C clamp. 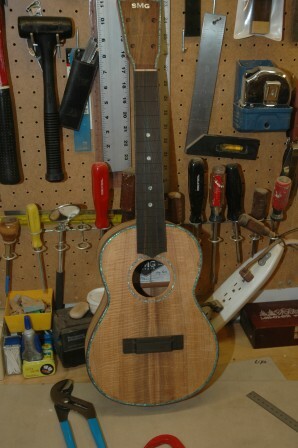 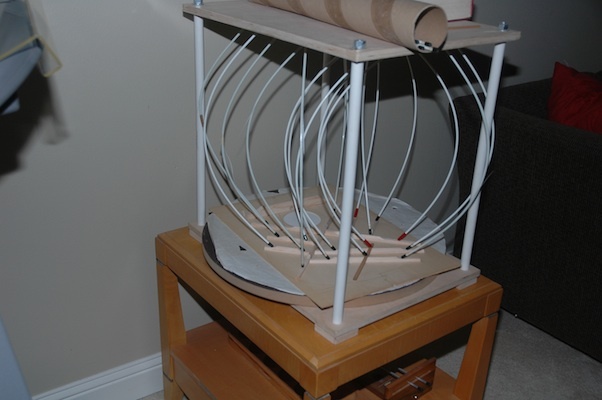 Finished attaching top and kerfing. 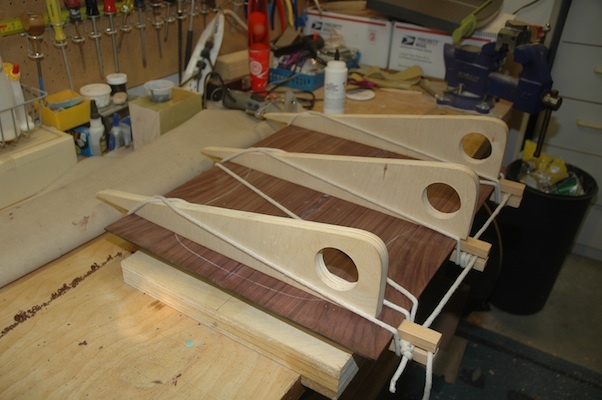 Back bracing is clamped in and glued and home made back reinforcement strips have been glued in. 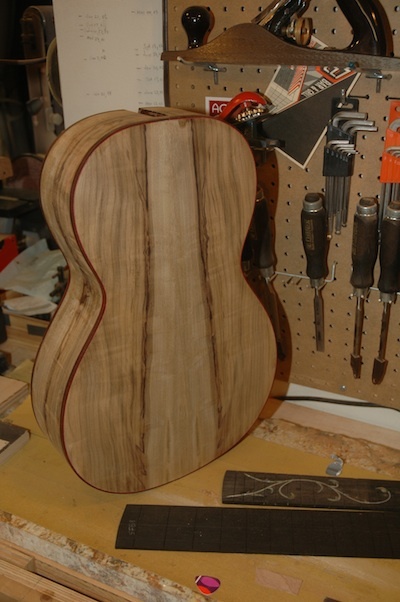 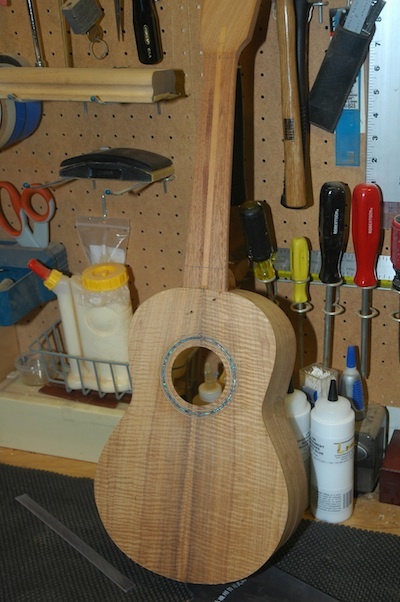 I tapered the neck and profiled the soundhole end. 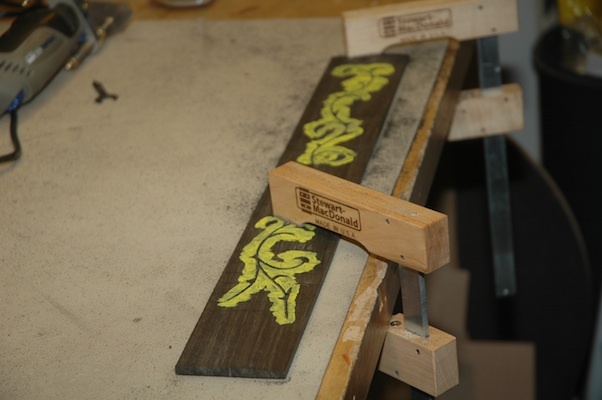 Back to work in the shop. 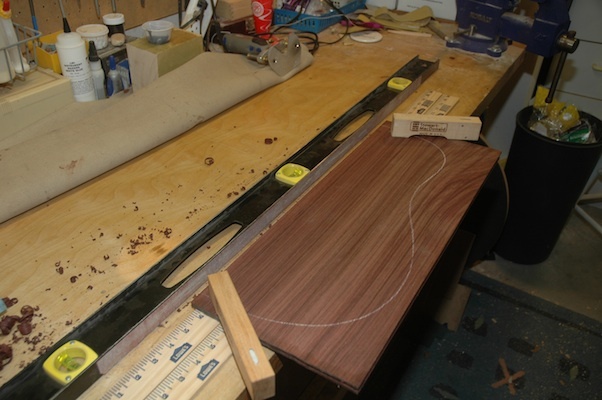 I’ve done the fretboard inlay for the hybrid, and started tackling portions of guitar 1202, the Rosewood OM also known as Bob. 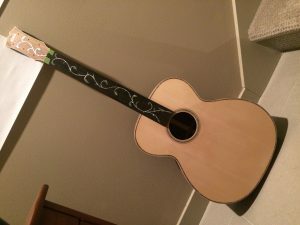 First, I joined the back. 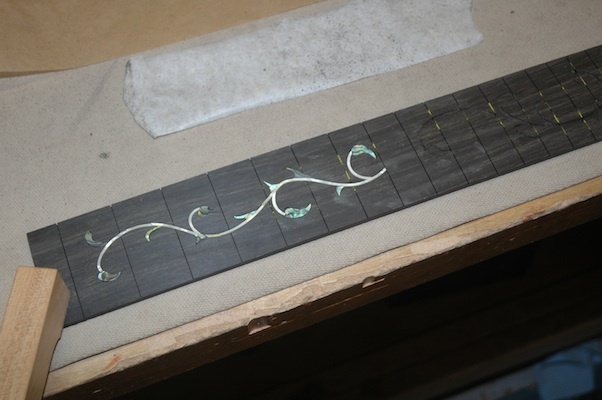 I tried using tempera paint to outline the thorn and vine inlay for the fretboard. 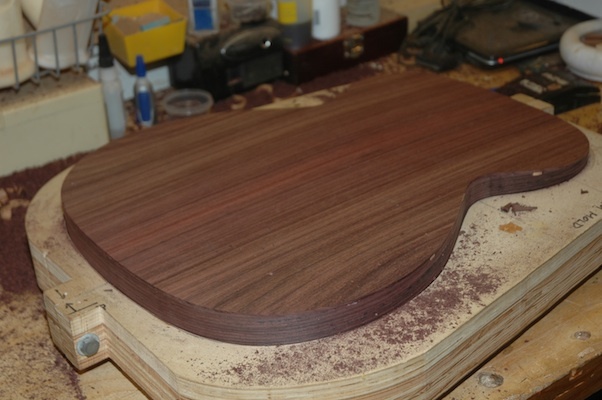 It certainly made for a clear distinction when diving in with the router to clear out the channel for the shell. 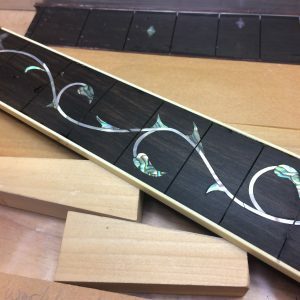 I was a bit sloppy wity the application and got too much on the shell and had to spend extra time to remove the paint from the shell before installing. 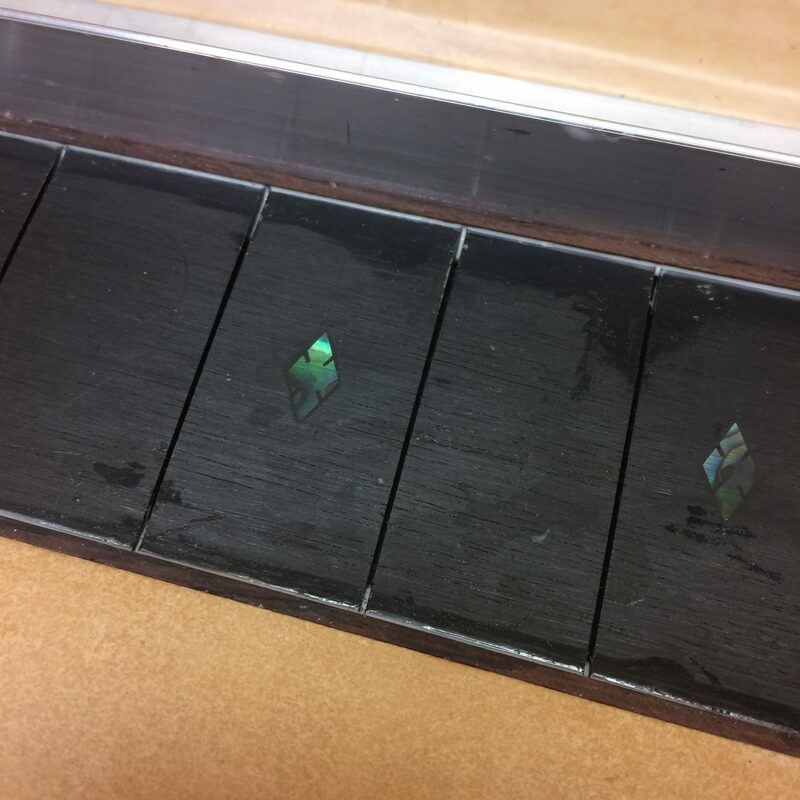 Finally, using black epoxy, the shell was glued in. 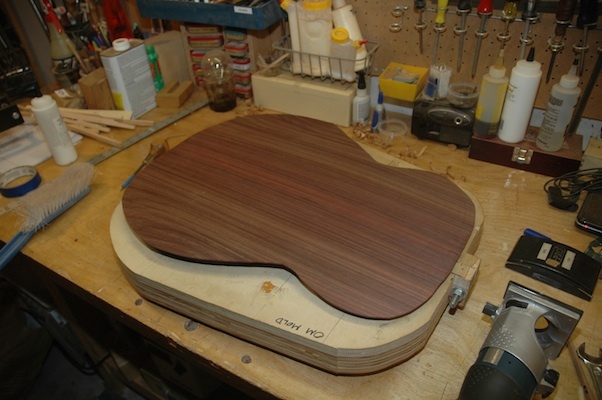 Note the excess splurted over the top. 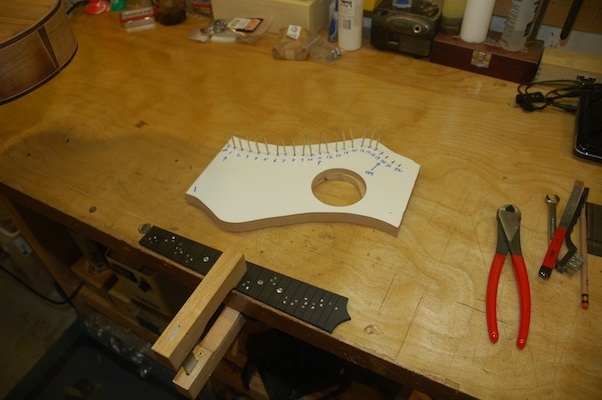 This ensures all gaps get filled, and a nice clean seam between the shell and the fretboard.